Feathers Falling from the Sky? Nope.. trees! He helped me with the set path as I had some issues targeting the node location. Feather Fall is an XML Append Mod adding random feather drops from destroyed trees. I run a very active dedicated server and this became necessary to replace loss of lootable nests. Feather Fall will allow drops after a tree is fully chopped down. Drop amounts depend on the tree growth, and location. 50 to 60% chance of drop. Drop counts, or amounts will vary depending on size and location of tree. Larger full grown trees can get to 80% drop with higher minimums and range of count, our amount. Trees on mountains have increased percentage and amounts. Snow and Burnt biome trees will NOT provide feather drops. 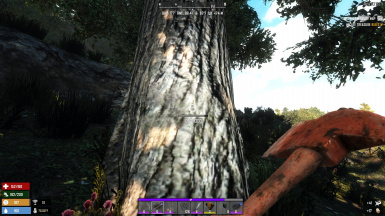 Player planted trees have zero percentage of drop, except full grown and even at full grown player tree the odds are approx 35% with little feathers. This mod is completely dedicated server friendly, no client files needed. This is my goal for all of my mods. Viewing the XML files can give you the exact % and drop count amounts.